I've just finished reading Robert Parker's Haunted Louisville 2, and was delighted with the history and the hauntings packed within this slender volume. Parker, otherwise known as "Mr. Ghost Walker," is the creator and tour guide of a popular ghost tour in downtown Louisville. Through this line of work, he's been able to collect a massive collection of stories and experiences about the Derby City's many, many ghosts! Eighteen chapters cover eighteen different haunted locations throughout Louisville and beyond, including John E's Restaurant, the Brown Hotel, Dillon's Steakhouse, and Louisville Gardens, just to name a few. Each chapter offers a brief, yet concise history of the location in question and an overview of its hauntings, supported by interviews with eyewitnesses and often, with a hands-on approach. Parker, assisted by several friends in the paranormal field, doesn't just write about the ghosts---he actually goes out and searches for them through on-site investigations. This format of not just relaying old information found elsewhere, but actually getting out in the field and conducting interviews and doing hands-on investigations, sets this book apart from so many other collections of regional hauntings. It really was a fun and quick read, and for the most part, very well written. There were a few very minor editing errors, but nothing that would detract from the actual content of the book, which was quite interesting! I'm trying to familiarize myself more with the haunted history of the Bluegrass State, and books like this one make it much easier to find well documented stories and the added bonus of up-to-date recent sightings. My only issue was the fact that there were a handful of locations featured in this book that were outside of Louisville and the immediate area. 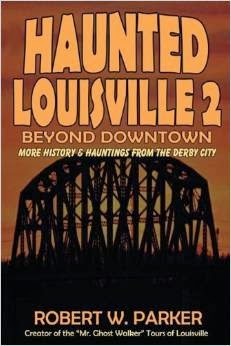 Still, I am very impressed and have definitely added the first book in this series, Haunted Louisville, to my wishlist!